The Xiaomi Mi Sphere and the Insta360 One are among the most popular 360 cameras to date. In an increasingly crowded market, these two cameras have carved a sizable user base thanks to their low price and excellent specs. Both the Xiaomi and Insta360 were released in 2017, however since the start of 2018 they have received major updates. The Mi Sphere can now shoot 360 video in 4K, whereas before it was limited to 3.5K and the latest Insta360 firmware update adds much improved stabilization and dynamic range. These cameras have been massively improved since they were released and therefore many older comparisons are no longer up to date. Let’s see how these two cameras fair against each other in 2018, with direct video, photo and stabilization comparisons. The above video is a direct video comparison between these two cameras and should show you the difference in both video quality and stabilization. Since both cameras had recently received major software updates that improved the quality of their video, I really wasn’t sure which was going to come out on top. The Mi Sphere video always looked good but was limited to 3.5K resolution, and I was worried that the 4K upgrade was actually going to make the quality worse by stretched out the pixels. The Insta360 One has had generally good video quality but has suffered from exposure issues and over saturation. Looking at the above video I would conclude that the Mi Sphere has superior dynamic range and can deal with direct sunlight better. 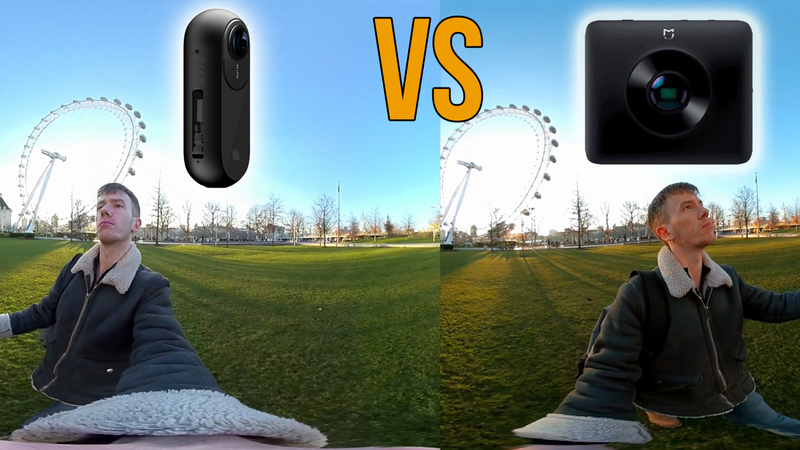 The Insta360 One still overexposes the sunlight which impacts the overall image. I also tend to notice more detail in the Mi Sphere video whereas the Insta360 can struggle at capturing similar details, especailly at a distance. This screenshot from the video comparison highlights some of these issues. You can see how the direct sunlight washes out the color in the Insta360 video, whereas the colors are a lot more vibrant in the Mi Sphere footage. 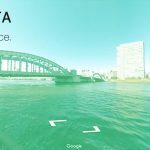 Stabilization and Horizon correction are very important when shooting 360 video. Without software stabilization you would have to keep your camera very still to ensure your video is watchable. Thankfully both of these cameras come with 6 axis stabilization powered by a gyroscope, but which one works best? A month ago the answer would have been easy, the Mi Sphere had much better stabilization which removed most vibrations and bumps from walking. The Insta360 One on the other hand really struggled, and even walking with the camera led to footage which was hard to watch. Clearly the guys at Insta360 noticed the issue, as they released a big software update which massively improved the stabilization feature. Now it’s better than the Mi Sphere (although both are pretty indistinguishable. NOTE: In order to get the best stabilization out of the Insta360 One you should stitch and export your video from the phone app and not the desktop software. For some reason using the desktop software to create your video leads to worse stabilization, check the video below to see the difference. Both the Mi Sphere and the Insta360 One can shoot high resolution 360 photos at 24 megapixels. This is the highest photo resolution of any consumer 360 camera, so you would think both are evenly matched, right? Actually one of these cameras has vastly superior photography capabilities and is even being used professionally to shoot virtual tours, something that would usually require a DSLR rig. As you can probably tell, the Mi Sphere example is superior in almost every way. While the Insta360 shoots large resolution images, it doesn’t deal with light, exposure or color balance as well as the Mi Sphere. The Mi Sphere seems capable of capturing more detail with the same number of pixels, likely due to different optics. Both cameras are also able to shoot in Raw DNG format, which is important if you want to do any significant editing as it allows you to retain the maximum amount of detail. The Mi Sphere is also capable of auto bracketing, where it will shoot 3 photos in a row with alternating exposure, you’ll then need to combine these photos manually to create a HDR image. It’s possible to get truly professional looking 360 photos from the Mi Sphere, and for a camera that’s just over $200 that’s pretty astounding. Livestream: Obvious winner here, only the Insta360 One can livestream. You can launch a livestream from the Insta360 App which is very easy to do; the Mi Sphere can livestream in 4K but the video quality tends to suffer unless you have a fast connection. The Mi Sphere can’t live stream at all. Battery: While the specs indicate the Mi Sphere has a superior battery, this isn’t the whole story. The Insta360 can either be used attached to your phone or independently, when attached to your phone it doesn’t use it’s own battery power. You’ll therefore find that the battery can last longer than you might expect, but for both cameras you’ll struggle to get more than 45 minutes continuous footage in a single full charge. This was shot before the upgraded stabilization was added to the One, so this type of video in the future should be a lot smoother! 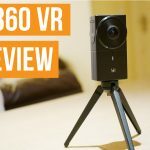 This type of video is becoming a popular use of 360 cameras, particularly for vlogging. Also known as re-framing, it removes the need to point your camera at anything when you shoot your video. The Mi Sphere has a very basic version of this in their desktop app which doesn’t really work very well. Software: The App for the Insta360 One is slightly clunky, but otherwise works well and rarely crashes. The Insta360 Studio desktop program is excellent and allows you to edit your 360 video very quickly and easily. You can also add stabilization, remove purple fringing and choose a high bit rate. The Mi Sphere App also works well and has a huge number of functions and manual controls, however the desktop software is pretty much useless (but you don’t really need it anyway). So which one should you buy? In most cases I would recommend the Xiaomi Mi Sphere (available here) because of it’s superior video and photo quality. I would only recommend the Insta360 One (available here) over the Mi Sphere if you were interested in the free-capture feature, which to be fair is an excellent feature. 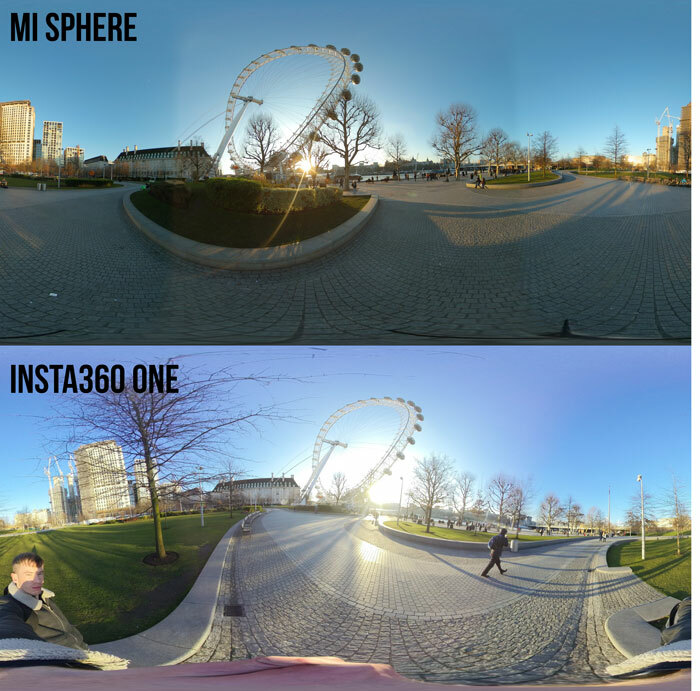 If you wanted to shoot both non 360 video and 360 video then the Insta360 One is the better option, but for 360 (especially photos) the Mi Sphere is the best bet. Check the links below for the current price of both these cameras, however the Mi Sphere usually costs between $210-240 where as the Insta360 One is $299. Love this blog Daniel! One question: On many pages, like Amazon, I read on the specs of the Mi Sphere 360 that the resolution is 3.5K. Was the upgrade to 4K available for all Mi Spheres 360s? Or do I have to watch out which one to buy? Thanks a lot! So I read the the mi sphere now has the free capture feature. But the feature I’m after is the tracking of a subject with reframing I know the insta software can do this but can the mi sphere app or desktop do that? Is there a way to use the insta app to apply the tracking to mi sphere video capture?